It was Sunday night when the boiler died and Monday morning when I rang the plumber but he didn’t turn up until this morning. However,he admitted that he had forgotten (!) and apologised profusely. Then , to my embarrassment, the damn thing fired at his first attempt. “But, I did exactly the same thing and it wouldn’t light” I assured him, so he turned it off and watched me try to light it. It was almost a relief when the pilot light went out as soon as I allowed the knob to come up slowly, and I was really pleased when the same thing happened when Mr Courtial did it. He dismantled some parts and I left him to it. Ten minutes later I took him a coffee and he explained that his colleague must have made a mistake when he put it together last time as there was something out of alignment. Of course, his mate only has one eye and so it must be difficult to judge distances. He checked that the boiler would relight if turned off and left saying as it was their fault there would be no charge. I wish there could be a TV programme highlighting honest tradesmen. He’d be a star! We had another workman in the house yesterday as, at last, Whale has decided he would like to have English TV. He doesn’t feel comfortable coming to watch with Bear and me (I wonder why??!!) so now we have a double LNB on the satellite dish and a second Sky box for the TV in his bedroom. Now we have to teach him to use the controls. 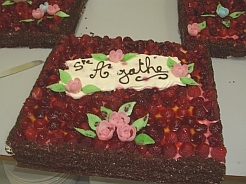 Last Tuesday we went to the AGM and and St Agathe lunch with the ‘old people’s club’. It was scheduled to start at 11 0’clock but by the time everyone had greeted everyone else, paid their subs and found a seat it was nearer 11.30 before the meeting got underway. The actual proceedings were even more chaotic than usual. We couldn’t hear a word because the folk all around us were having their own conversations in loud whispers and Madame Chairman didn’t have a microphone this year. At about midday people began to get up and walk around so we assumed the meeting was over and went to find out seats at the table. The meal itself was excellent – champagne and nibbles – boudin blanc in mushroom sauce – trou Normande (lime sorbet with mirabelle brandy) – stuffed chicken escalope with dauphinoise potatoes and stuffed tomatoes – cheese with salad – and, the piece de resistance: gateaux St Agathe – three wonderfully light concoctions of sponge cake, cream, raspberries and chocolate. Traditionally it’s the turn of the men to serve the ladies on this occasion but I’m not sure if this stretched to the washing up. On a different note, the chicken house was delivered on Thursday and I’ve put in an irder for four ‘poules pondeuses’ to arrive in the Spring. The greenhouse is due to be delivered in early March. All we need now is some Spring weather but at the moment there are still vestiges of snow – and the boiler’s gone off – again! Mid February is the time for one of my friends to come over to see her favourite French specialist in Charleville. Fortunately she travelled with another friend as the journey on Thursday was horrendous due to hold-ups and delays at the tunnel. In fact they sat in the car for the best part of 12 hours and were tired and aching by the time they arrived at nearly midnight but kept each other’s spirits up by having a good gossip. The appointment was at 11a.m. on Friday and I went along as interpreter. Dr C was running a bit late because he was getting used to new software on his computer. My friend was his last patient before he started his holiday. On the way there she had been telling me that she’d had an allergy test and was allergic to chlorine (which meant no more swimming except in the sea) and preservatives (particularly in bread) so when the doctor asked if she had any allergies we both answered simultaneously: “chlore et conservateurs” and “chlorine and preservatives”. She looked puzzled but I fell about laughing and explained that ‘preservatifs’ means ‘condoms’. The doctor realised what had happened and laughed as well. She won’t live that down in a hurry! *Faux amis = words that look the same or similar in another language but mean something different. We were nearly out of wood so I rang Pascal to see if he could bring some. He came round the next evening and said that he thought we were avoiding him. Why? Partly because my daydream of a daughter had ignored his wife, Florence, when she walked past their house to the library one day and partly because I had bought some wood from another supplier when he only had oak left last year. (There’s nothing wrong with oak but, apparently, you shouldn’t burn it all the time). Anyway, apologies and a taste of my special Christmas calvados later he was happy to oblige with a wood delivery. However, was he taking his revenge when he brought 4 steres (4 cubic metres) instead of the 2 I thought I’d asked for? The garage is now full to bursting but there’s no harm in having a good stock of logs. Problem is, the other man had phoned and I’ve ordered more to be delivered in the Spring! He has a table in his room set out with kettle etc so he can make himself tea or coffee when he wants it. As we have very hard water I have to descale the kettles with vinegar every so often. Yesterday I put the vinegar in, turned it on and warned Whale not to use it. Then I went off doing chores and forgot to empty the kettle. About an hour later, Whale called me. Funny, I thought, it was fine on his cornflakes. Then the penny dropped. He had made himself a up of tea with vinegar and, not surprisingly, the milk had curdled when he added it. And yes, he had said it smelled off but he hadn’t recognised that it was vinegar! Yes, the weeks have flown by since the last post and there’s not a lot to show for it but here are one or two examples of how lif’e’s been treating me lately. After the Italian class on Wednesday Guido, our teacher, became rather curious after going through the homework – “describe your house”. I had mentioned that Whale’s bedroom was kitted out with an electric bed and a wheelchair and this had aroused Guido’s curiousity about exactly who lived in our home. When the others had gone home he started with some gently probing questions and Isabelle, the librarian, who knows all about the set up, started to giggle. Then came a very naughty question. It took me a second or two to work out the translation but he was asking which one I slept with. “Neither of them” I replied. “Well, in that case you need a lover.” was his response. Incident number two was equally embarrassing but not so funny. The local Cora advertised big discounts for bulk buying and we decided to stock up on loo rolls, catfood, tinned stuff and other non-perishables. The only problem was that the account we ‘live on’ didn’t have enough funds and we’d have to break into savings. I don’t have a card for this account (although Bear does) so I proffered a cheque. This was fine the first time we went through with a trolley laden with 96 loo rolls, 60 kitchen rolls and quite a few litres of UHT milk but when we went back to stock up with less bulky but more expensive items, at the checkout the machine spat out my cheque without printing it. I couldn’t see why there should be a pronlem so I said I’d wait. She wasn’t happy and neither were the people in the queue. However, we didn’t have to wait long before another lady appeared. She looked at my passport, scrutinised the cheque again and then got on the phone. By this time I was getting rather angry and embarrassed – and probably a bit confused – because I really didn’t take in what this woman was saying – except that it was something to do with insurance. So we had the option of leaving our trolley behind or paying by card. Fortunately Bear had it with him and I remembered the pin code. It all went through without a hitch this time but I’m not sure we’ll be going to Cora again in a hurry. There is one bit of (probably) good news n that the family have finally conceded that it’s a good idea to have chickens and make a determined effort to grow our own veg this year. The greenhouse has been ordered and I’m surfing for chicken houses now. However, the rest of the garden will have to be fenced off before we can buy any poultry. When things are underway I’ll keep you posted! This weekend we have invited our friends to celebrate their recent birthdays – 83 and 80! Next weekend some friends from England are coming over and then it will soon be the end of March when we’ll meet my sister for the first time. I will try to post more regularly – especially as CC had a laptop for Christmas so shouldn’t be stuck in front of my computer every time I want to use it – but it looks as though life is going to be hectic.